Happy Monday everyone!!!! DO YOU LIKE CHARMS???? 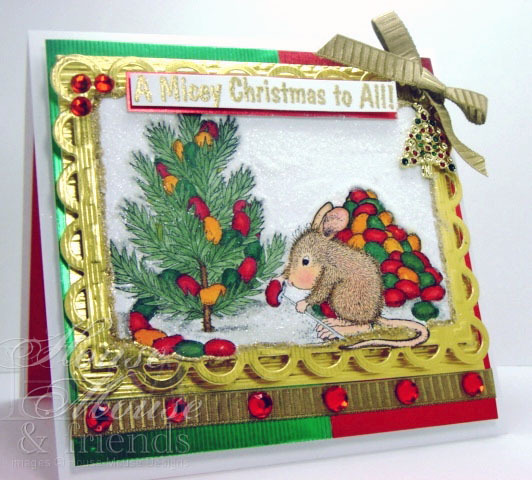 Sure hope you do 'cuz it's time for another House-Mouse & Friends Challenge!!! Guess who is hosting this week??? That's right, yours truly here! heheh... AND if you know me, ya know I really LOVE CHARMS!!! I actually have quite a stash of CHARMS and will be giving away a baggie full of CHARMS to one LUCKY-YOU who comments both here & on our House-Mouse & Friends Monday Challenge Blog for Challenge #84 by closing date of Dec 19th!!! There is a great prize giveaway from our generous sponsor Simon Says Stamp awaiting one lucky participant who joins us on this new Challenge. :) That prize is in addition to the CHARMS that I am offering here. So, what's the challenge you will want to play in?? Well, I would love to see your *Charming* Christmas Trees that feature any of the adorable House-Mouse & Friends characters. Bonus points will go out to those of you who also use CHARMS on your projects for this challenge. :) So come on, join us for your chance to win!!! Below is my CARD for this **CHARMING** Christmas TREE Challenge. This card is actually very sparkly I.R.L.! I took pictures with different angles to try to capture that shine. The entire white panel is glittered, but not very noticeable in this picture. These beautiful Metallic Textured papers simply don't like to be photographed! LOL! Stamps: House-Mouse Designs, Inc, "Stringing Jelly Beans" featuring Amanda, #HMOR1023, from 1997. Also, Stampa Rosa 1998 Sentiment. Now head on over to HM&F Monday Challenge BLOG to check out the CREATIONS by the Design Team to help inspire you. Dont forget to comment for your chance to win those CHARMS! hi america, this is a lovely card. beautiful colors and frame work. wouuuuuuuuuu what a beautyful card!!! What a precious Mouse House image - they always make me smile :) Love how you've coloured and framed it. Great card. What a fun image and your coloring is perfect....fabulous card!! Love this image, he's working so hard to decorate!! Love the gold frame work, really sets off the beautiful coloring! Such a beautiful holiday card. I got to use some of my wonderful treasures you sent, on my card this time, thanks again. Thinking of you. Oh this is absolutely adorable America! Hi America - it's only taken me 3 days to get here!!! Absolutely stunning card!! Fantastic layout and fabulous papers, I love your colouring of the adoraable image - there's so much depth and intensity to it and that little tree charm is awesome. Very pretty! I love the gold! Beautiful, America! Love all the gold! Oh that is so bright and colorful! Love that stamp! You really did it justice with that card! Gorgeous!! Gorgeous card....such a cute image! 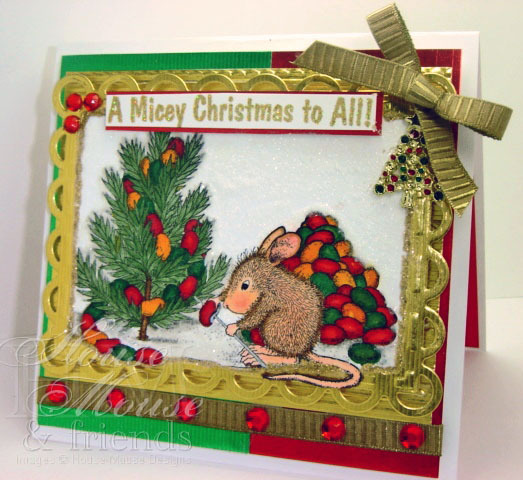 Just a quick note to tell you how much I like your House-Mouse Designs® Christmas card. The colors are awesome and fun. How cool America...your cards are always an inspiration!